See in Glossary reference shaders, and setup their parameters (textures, colors and so on). See in Glossary). You can also write your own shaders and apply post-processing effects. See in Glossary languages (see writing shaders page for details). See in Glossary section allows specifying default textures for a shader. Whenever a new Material is created with this shader, these textures are automatically assigned. 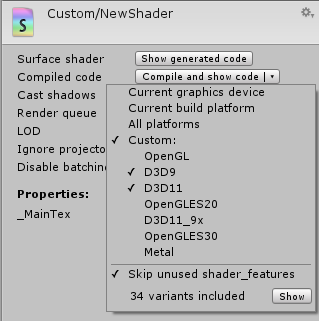 See in Glossary, the Show generated code button displays all the code that Unity generates to handle lighting and shadowing. 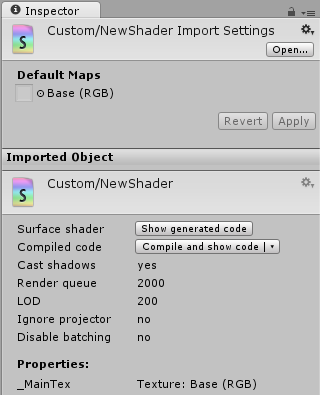 If you really want to customize the generated code, you can just copy and paste all of it back to your original shader file and start tweaking.